Dumpster Diving, Genius or Gross? When the weather is in the triple-digits, there's probably no better place to stay cool then in the pool. 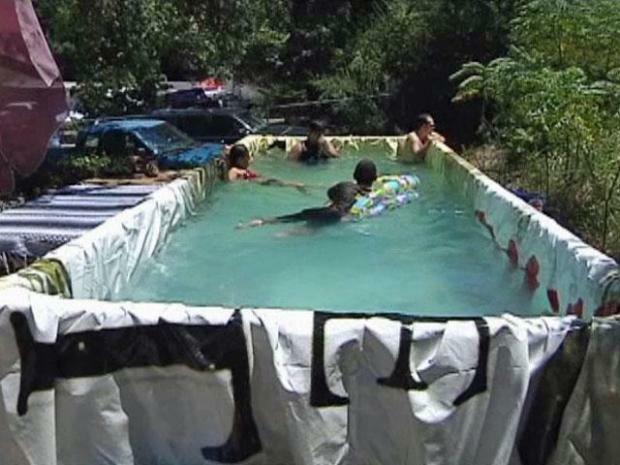 Those without a pool have to find creative ways to escape the heat. Enter (say this with you tongue firmly planted in your cheek) the West Dallas County Club. The urban pool is a dumpster, lined with an old Miller Genuine Draft billboard wrap, filled with water (and Clorox), sitting on a vacant lot/community garden in west Dallas. "Everybody thinks it's really weird. They did it in Brooklyn and in Brooklyn the people who started it actually made a business out of doing this," said Marina Griggs, a community gardener. "It cost us probably about $350 and it's hard to get a 20-foot pool anywhere for that kind of money." Welcome to the West Dallas Country Club, a dumpster pool on a vacant lot in Dallas. Membership is by invitation only and the location is top secret! Membership to the West Dallas Country Club is by invitation only and good luck finding the urban pool. "It's still Top Secret as far as the location goes. We're not positive what the reaction will be to a dumpster pool in Dallas," said Griggs. The group plans to recycle the water, using it to water their garden, and when the two-month rental on the dumpster is up, they plan to fill it with garbage and debris from the vacant lots nearby.